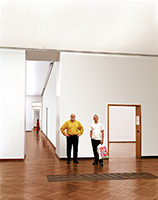 Art Spaces consists of a series of life size photographs of people who are observing art works within the neutral white space of the museum. 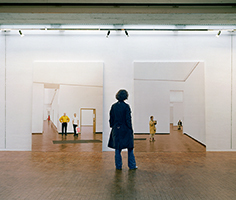 The art works themselves are significantly not visible since viewers were sometimes photographed from the front while in other cases the art works have been deleted through image manipulation. 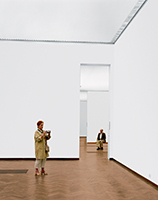 For this reason the people and their behaviour in watching art become the focus of attention while the space of the museum is not characterized by the art but by the characteristic architecture, most notably the white walls and floors. In installation the large photo panels are against the walls yet set on the floor so that they form a continuation with the physical floor. In this way the spectator of these works is being actively situated in a space and position which rhymes with the figures in the photograph. 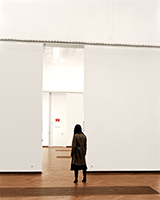 The works function as an indirect mirror in which the viewers become conscious of their own behaviour and attitude in the process of looking at art.